Flores is not the first Hispanic to play pro football, but he is the first Hispanic to play starting quarterback for an NFL team and was first to win four Super Bowl rings. OAKLAND, CA -- In recognizing Thomas Raymond Flores (AKA Coach Tom Flores), the National Council of La Raza (NCLR) has out done the one organization that is supposed to acknowledge individuals who have accomplished outstanding athletic fetes, the Pro Football Hall of Fame (HOF). It took one of the nation’s largest Hispanic organizations to present Coach Tom Flores with the prestigious “Roberto Clemente Award for Sports Excellence.” The award is presented by NCLR to sports professionals who positively portray Hispanic Americans and promote efforts to help Hispanics across the U.S.
Not to say that the HOF should induct Flores based on his ethnicity, however, it has been hinted that perhaps the oversight of Flores induction could be based on his Mexican-American background. Still, others allege that his continued affiliation with Raider’s owner Al Davis has poisoned his chances of being recognized. It’s possible, but unlikely. Flores is not the first Hispanic to play pro football, but he is the first Hispanic to play starting quarterback for an NFL team and was first to win four Super Bowl rings. But, apparently that isn’t enough for the HOF. Of the 267 members who have been inducted into the HOF, only 2 are Hispanic – Tom Fears, a receiver for the Los Angeles Rams (1948-1950), and Anthony Munoz, a lineman for the Cincinnati Bengals (1981-1991). Not to minimize their accomplishments in the NFL, Fears and Munoz were very deserving of an induction, but in weighing their accomplishments in the NFL, Flores stands head and shoulders above them. Born March 21, 1937 in Fresno, California, Flores grew up picking grapes and playing football for Sanger High School. 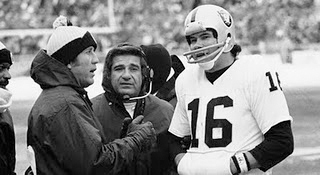 Upon graduating, he headed north to play for the University of the Pacific Tigers and upon graduating he went to play for the Canadian Football League before landing as the Oakland Raider’s first Quarterback from 1960 to 1966. These weren’t easy years for the start-up team since they had to play their games at San Francisco’s Kezar and Candlestick Stadiums until Oakland completed the Coliseum. As the Raider’s quarterback, Flores averaged a 50 percent pass completion rate, and gave them three winning seasons before being traded to the Buffalo Bills in 1967. Two years later he was traded to the Kansas City Chiefs where he retired in 1970. Interestingly, nearly every player Flores coached in those championship years is now part of the Pro Football Hall of Fame, except him and another Mexican-American, Jim Plunkett – the starting quarterback for the Raiders in the 1984 Super Bowl game. Today, Flores remains tied to the Raiders as the “color man” for the Raider Nation Radio Network. But, it’s his community involvement and giving that is also very impressive. Since the 1980s, Flores has hosted an annual golf tournament in Los Angeles to benefit the Boy Scouts with Disabilities, an event that has raised over $3.5 million since. In addition, he established the Tom Flores Foundation that benefits low-income youth in his hometown of Sanger, California, which also named their high school stadium in his name. Flores has even found the time to author his biography, “Fire In the Ice Man,” and co-authored “Tales of the Oakland Raiders,” two books still selling well across the nation. Obviously, the only thing missing is his induction into the Pro Football Hall of Fame. Two other coaches, Mike Ditka and Tony Dungy, share similar records as Flores, of which only Ditka has been inducted. Dungy still has time to be inducted, but unfortunately, this is Coach Flores’ last year to be inducted into the HOF, a process controlled by sports writers. Since 2009, the National Football League has stated it wants to grow its Hispanic fan base. There would be no greater recruitment tool than inducting Flores into the HOF and use the ceremonies to market the NFL to Hispanics across the U.S. Not all of the 50+ million Hispanics living in the U.S. are soccer fans. "Thank You, greatly" Mr. Perez, Being that few Latinos are in charge of media outlets like yours (which, obviously denies the public the opportunity to read about the positive points of views of Latinos and Mexican Americans that have excelled above and beyond the norm, your glowing comments of Tom Flores and his accomplishments in pro football are appreciated by the thousands (no, tens of thousands) of Tom Flores fans. There is not more that I can add to your remarks other than to say that I have personally known the "coach" for over 25 years, first meeting him while I served as the public relations chairman for the Boy Scouts/Tom Flores Celebrity Golf Tournament in 1988. I didn't have the opportunity to know (and grow) to know Tom Flores during his quarterbacking and coaching years, but have the privilege of working with him in his philanthropic endeavors. It has been during those times that I have seen the character, class and dignity of this special man, and can see that special quality of excellence behind his commitment to the downtrodden, infirm and especially to the betterment of the youth in our country. He obviously has been a positive role model and source of inspiration to his colleagues and team players (many whose excellence on and off the field has already earned them a place in the Hall of Fame); but there are so many community, civic and government leaders who have also been inspired by his commitment to "community." I realize that the National Football League Hall of Fame voters do not take into consideration the quality of commitment to "community" when deciding who should be inducted (as is evident by some who are now members that have tainted the integrity of the HOF by their off-the-field activities since their induction); but obviously, a professional football person's overall commitment to excellence off the field as well is what makes most Americans proud of their sports heroes that have been inducted into that noble fraternity. 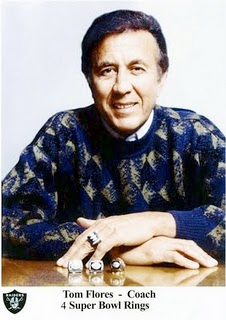 As we witness the vitriol and mean-spirited manner in which America is responding to an immigration issue that needs a sound and humane resolution, I pray that Tom Flores will be considered by the HOF for induction this year, because I personally know thousands of football fans who are not Latino who admire Tom Flores solely for what he has done in the annals of America's number one sport. Once again, than you for pointing out to the rest of our nation that the HOF most definitely needs to induct the one person who I believe the Raiders had in mind when they coined their team's slogan, "A Commitment to Excellence."